The audience, and its role in the performing arts, has been in transition for the last forty years. Watching a dance has grown from a passive spectator activity to a mentally involved exercise. Thoughtful audience members are required to actively contemplate what they are seeing. Where is their focus drawn? Was it to one specific dancer or to the overall picture created by the entire company? Does the choreography represent a story, an emotion or nothing at all? How do the movements fit with or work against the music? These questions help the audience connect with the work, and perhaps, decipher it the best they can. Yet, sometimes, the audience is called on to further supplement these intellectual queries with a physical participation. 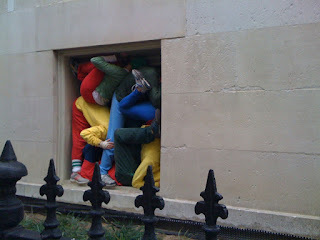 Willi Dorner's, Bodies in Urban Spaces, examines the notion of viewership in both cerebral and corporeal planes. Bodies in Urban Spaces is a mobile, outdoor performance that takes dancers and spectators on a tour through the streets of a particular city, this time, Washington, D.C. The dancers jog between a dozen or so designated settings. And, in each individual location, create a different sculpture using their bodies and D.C.'s architectural terrain as the materials. Because the piece is set outside, and Friday's performance took place at the height of rush hour, the notion of the audience was immediately challenged. Yes, there were those of us who were present for the sole purpose of the performance. Others just happened upon the piece through the course of their day. Viewership was made permeable by the unique setting of Bodies in Urban Spaces. There were many observable sensations with Dorner's work, starting with a significant anonymity. The performers were all dressed in brightly-colored sweatpants, T-shirts and hoodies. The costuming definitely helped the audience find the dancers in their sculptural creations. Sometimes, they were hidden in between newspaper boxes or in a small space between two buildings. The brightness of their clothes made them stand out against the city landscape. But, they were all dressed the same as each other, and their faces were purposely hidden in the formations. The audience did not know who they were looking at, just that what they were looking at someone. Second, there was an aura of mystery with the piece. Because the dancers jogged ahead of the audience, we were not able to see them construct the work. Some of the postures seemed impossible, yet the dancers managed to very quickly (before the audience caught up with them) arrange themselves into their static position. Though they missed the initial composition, the audience was privy to the dismantling of each human monument. This did not erase the mystery, but it did provide a brief glimpse into the enigmatic poses. Finally, the line that exists between the dancers and the audience was made more transparent. Everyone, regardless of their role in the work, was mixed together in the same space. There were distinctions as to who was who, but there was also a camaraderie that all present were practicing and participating in art-making. 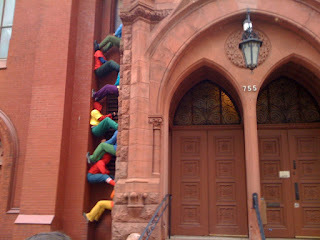 Willi Dorner's innovations are thought-provoking, for sure. And, Bodies in Urban Spaces elicits a mindful questioning of the accepted roles of viewership, performance and space. It definitely gives the feeling that there is something deep and important happening, and I think there is. But, maybe the piece also teaches the audience that watching dance can not only be an analytical conundrum, but also a fun adventure through your city.